Shannon Crystal. Dublin Ice Bucket. Ice Bucket. Crystal Cut Glass. It is only available for a combined weight of 4 lbs or less. NEW in box. NEW and UNUSED but MISSING LADLE. 8.5 oz.cup capacity. 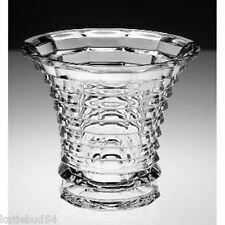 Cut Glass Shannon Crystal. Shannon Crystal. Renaissance ICE BUCKET. Renaissance Ice Bucket. A Great Wedding Anniversary Gift! Crystal Cut Glass. It is only available for a combined weight of 4 lbs or less. Tray & Tongs. Warranties & Technical Support are available only through the manufacturer, NOT US! Cut Crystal. GOOD: moderate amount of overall wear and obviously have been. "Let US Turn Your Closet i ntoa CASH Machine !". 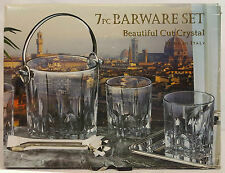 7 PCs Barware Set Beautiful Cut crystal, Made in Italy 14” by 11” Silverplated Tray 4 pieces 11oz DOF 27 oz I️ce pail with silverplated handle. Silver plated I️ce Tong. SALE BY WEARETHEDEALS. 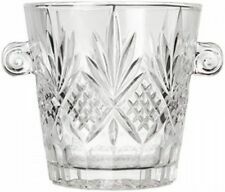 Used to hold ice for drinks. Material: crystal. We do not accept P.O. Boxes. 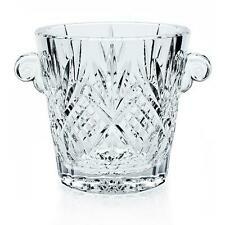 GODINGER PETITE CRYSTAL PANELLED WINE/CHAMPAGNE COOLER. Features 14 panels and handles. 6 1/2 WITH HANDLES. My hobby is to hunt for treasures.